There is an abundance of tools available for every size business to organize their contacts and leads, automate sales and marketing processes, manage their online storefront, and integrate their essential business applications. There are relatively few tools that can do all of these. In the past, the ones that could were nearly the exclusive province of large enterprises. Happily, we live in an era where lower boundaries for software development and near-immediate accessibility allows for cost-effective solutions for companies of any size. Which brings us to Infusionsoft and HubSpot — two very popular, highly-regarded CRM solutions which unite sales and marketing automation with numerous auxiliary business functions in a package tailored for SMBs. How do these two solutions rank against each other? Time to put Infusionsoft and HubSpot up against each other and find out which solution serves the needs of their overlapping customer base best. Let’s take a look at our two competitors. Infusionsoft was founded in 2001 by Scott Martineau, Eric Martineau and Clate Mask, and found its raison d’etre in 2004 with its first script for sales automation. Since then, the company greatly expanded its size and focus and attracted attention from major Wall Street investors, including Goldman Sachs and Bain Capital Ventures. Infusionsoft was ranked in the top 50% percentile of Inc. 500/5000’s fastest growing private companies for eight years in a row. As of 2017, Infusionsoft employs over 650 people, serves over 30,000 customers and brings in over $80 million in revenue. Its current focus is marketing and sales automation in CRM software for small businesses. HubSpot was founded in 2006 by Brian Halligan and Dharmesh Shah in response to the shortcomings of ‘interruptive’ marketing. HubSpot sought to create a more inviting, empathetic form of marketing engagement through inbound marketing, which emphasized attractive content, website, and email design to entice prospects rather than intrude on them. The company grew quickly and became influential in shaping the tone of online marketing campaigns. In 2014, HubSpot went public with an IPO that drew in $125 million. Today, HubSpot employs over 1,000 people, serves over 21,000 customers and brings in over $186.5 million in revenue. Its software provides tightly aligned marketing and sales automation in a sophisticated online ecosystem. Each vendor offers several subscription tiers. In this head to head, I will compare Infusionsoft’s Complete plan with HubSpot’s combined Marketing Pro and Sales Pro plans. These plans were chosen because it represents the vendor’s complete range of features for their target customers (Infusionsoft’s case) or because it is the vendor’s most popular plan, which indicates at least a plurality of customers consider its features and pricing most balanced for their needs. As HubSpot has only three plans — Basic, Pro and Enterprise — this plurality could well be a majority. Let’s take a quick look at a feature comparison of the two plans. Both Infusionsoft and HubSpot subscriptions are annual contracts billed monthly. Note: HubSpot applies the technical contact limitations of combined plans. For example, subscription to both the HubSpot CRM and Marketing Pro plan has a combined technical limitation of 15,000,000 contacts. However, the contact tier pricing of the Marketing plan will still apply — customers will need to pay $50 per 1k contacts over the initial 1,000 contact threshold. 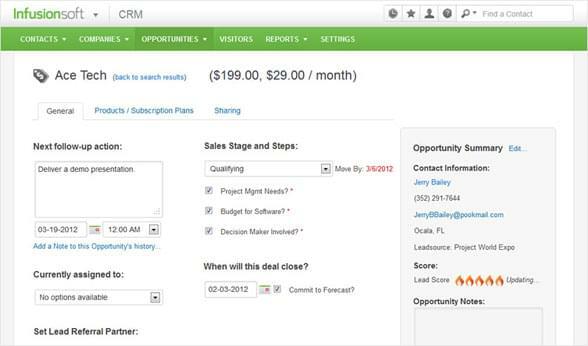 HubSpot CRM and Marketing share the same database so contacts added to the CRM will affect your Marketing pricing. See our Pricing section for details into other subscriptions and the respective onboarding packages. HubSpot is credited for its disruptive influence on the traditional ‘interruptive’ marketing model by ushering in the era of inbound marketing. In the years since, other marketers took note, and while credit is where it’s due, the inbound marketing capabilities of other marketing automation providers can credibly rival HubSpot’s. Infusionsoft’s marketing tools are certainly no slouch. 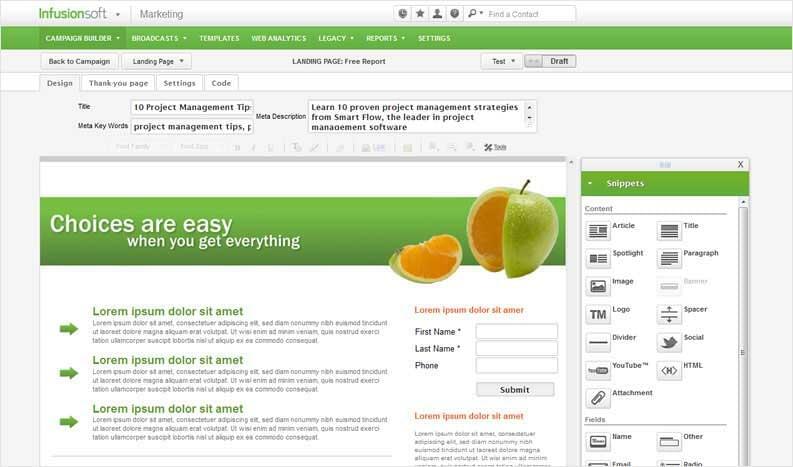 Infusionsoft provides users with a visual campaign builder which is used for planning stages of automated drip campaigns. It provides a bird’s-eye view of campaigns for relatively clear management. If you know what each stage is intended to represent, it should be no trouble to understand. Infusionsoft provides automated email marketing tools with customizable triggers. Emails can be sent out on timed delays or event-based triggers such as signing up for a newsletter, downloading online content, reaching a certain lead score threshold, and so forth. Subsequent triggers allow for a cascading series of personalized emails. Infusionsoft also enables users to build custom landing pages. These can be designed through a landing page builder that allows users to drag page elements like titles, spacers, social buttons, logos and dividers throughout the page. This ensures recipients of personalized emails that click certain links are brought to pages specifically tailored to their expressed interests. Finally, Infusionsoft provides email and website tracking, so users are able to detect qualifying data on their prospects — such as lead source, time spent on page, which links were clicked, digital assets downloaded, their browser, operating system, their screen resolution and so forth. This allows for highly specific contact and lead segmentation. Data derived from email tracking, such as open rate, clickthrough rate, time spent viewing email, bounce rate and device type allow for more effective A/B testing and content optimization. In all, Infusionsoft offers considerable customization tools for online marketing essentials in addition to plenty of guidance on how to craft your marketing assets towards your goals. It’s a robust platform that closely aligns with its sales automation and CRM capabilities, which we’ll get into later. As mentioned, HubSpot earned its stripes for ushering in the inbound marketing era which influenced the marketing software space, including older, more established rivals. You could expect that HubSpot provide ample tools for honing your inbound marketing strategy and you would be right. 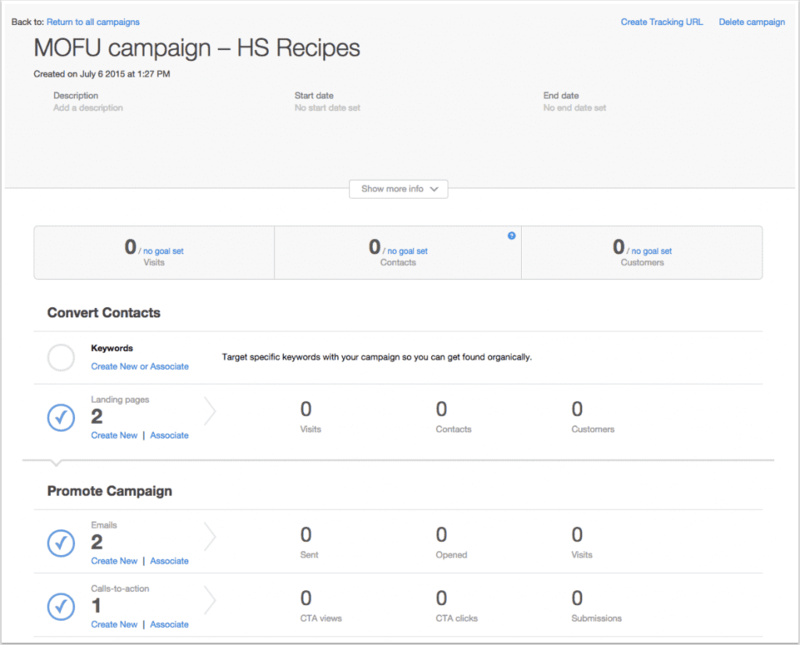 HubSpot allows for centralized campaign management from the HubSpot Campaign App. Opening the app presents a campaign dashboard with your campaigns assembled in a list; selecting an individual campaign brings you to the Campaign Overview page where users can edit and view all content related to the campaign in addition to campaign-related metrics, such as emails opened, calls to actions clicked, and so forth. 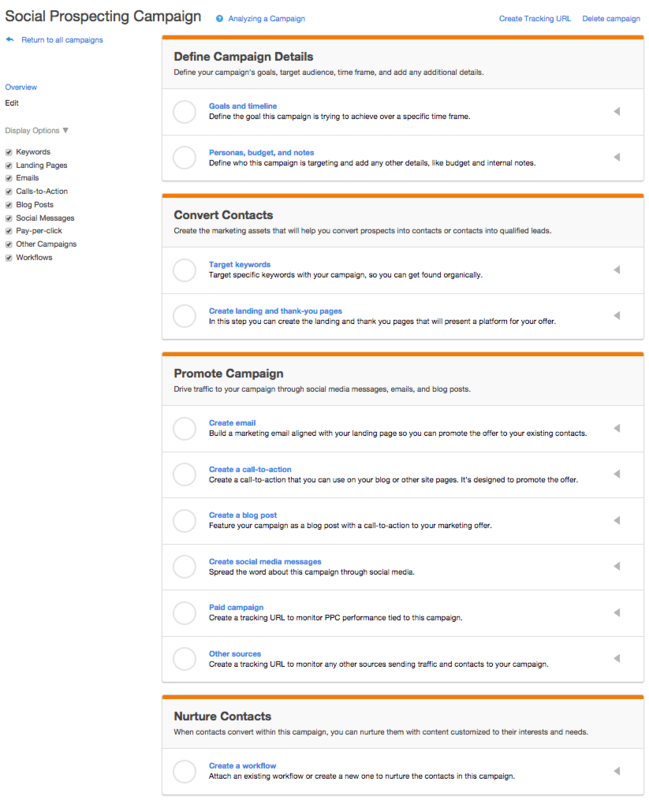 The HubSpot Campaign App also includes a Campaign Wizard. It appears as a checklist for building an inbound marketing campaign and includes tasks such as setting goals and a timeline, targeting keywords, creating landing and thank-you pages, creating emails, calls to action, blog posts, social media messages and so forth. There is also a task for creating workflows to nurture contacts through automated email marketing. HubSpot provides a library of templates and pre-built elements for custom and personalized landing page and email design. The HubSpot Marketing Pro plan also enables dynamic content based on website visitors’ or email recipients’ segmentation details. In addition to their library of resources, HubSpot tracks performances of your online marketing assets for reporting and A/B testing for users to optimize their ROI. Verdict: There are many aspects to a marketing campaign, online and offline, but the chief concern of this review is the extent to which each platform provides tools to build and execute digital marketing campaigns. Features oriented towards inbound marketing comprise a large portion of any online marketing platform and Infusionsoft and HubSpot are no exception. Both platforms provide considerable tools for easy design, customization and performance analysis. That said, HubSpot built its name on inbound marketing; their tools for asset design for pages, emails and calls-to-action in addition to their library of templates and resources, tested SEO recommendations and social media analytics for your paid ads give HubSpot users an edge in the inbound marketing game. Infusionsoft is certainly no slouch; their campaign builder is more intuitive than HubSpot’s, ready-made campaign templates are available in the Infusionsoft marketplace, and their analytics are just as good. Infusionsoft’s marketing features are likely better suited for businesses without a deep pool of marketing experience looking for a smoother onramp to online marketing, while HubSpot provides a bit more options for marketers to get hands-on with optimization. My vote goes to the vendor who offers more tools, which is HubSpot, but a strong case could be made for Infusionsoft depending on your use case scenario. Infusionsoft offers considerable sales automation, opportunity management and ecommerce tools that closely align with its marketing features. It doesn’t offer visual drag-and-drop sales pipelines like some CRMs; rather your prospects and leads are presented in a more conventional list format. Infusionsoft provides predefined pipeline stages, while users can add or customize stages to fit their own sales processes, which can be linked to sales or marketing campaigns. Sales reps move prospects through stages manually while Infusionsoft automatically updates tags or triggers automations based on movement into or out of a stage. The Complete plan also provides ample online sales tools, such as page templates, custom order forms, shopping carts, as well as capabilities to process one-time or recurring secure payments, fulfill orders, manage inventory and send custom quotes or invoices. Users can create custom referral programs to reward customers who bring in more business, create flash sales, re-engage lost leads and so on by implementing campaign templates available for free download from the Infusionsoft marketplace. Meanwhile, as mentioned above, updates to opportunity records can trigger automations that interact with online storefront data. Infusionsoft will automatically notify sales reps when customers accept a quote, then convert those quotes into orders and update the CRM with the customer’s purchase history. This data will contribute to further personalization of post-purchase marketing efforts and customer satisfaction outreach. Moreover, Infusionsoft will automatically calculate lead scores based on user-defined tags and qualified activities, then present the hottest leads at the top of the sales rep’s dashboard. Infusionsoft provides excellent tools for small businesses to establish and maintain a polished online storefront while managing inventory, fulfillment and payment processing. Its automations effectively streamline task and appointment management, notifications, stage-related processes and lead scoring while storing this data within the CRM for a comprehensive overview of each contact’s relationship with your company and the effectiveness of your sales and marketing activities. HubSpot’s Marketing Pro and Sales Pro plans are complementary — Sales Pro offers expanded email tracking, limitations on templates, integrated calling time, number of Sequences (a series of automated, targeted emails) and significantly increases the number of contacts available for the Marketing plan. Businesses that are looking to conduct both online marketing and sales through HubSpot would most likely combine both plans while subscribing to the number of Sales seats that suits their needs ($50 per user/month). 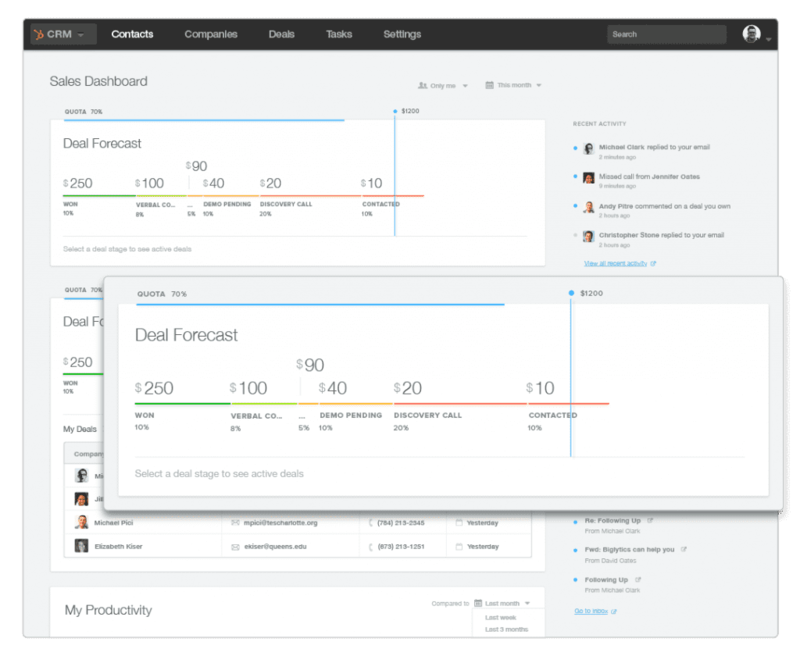 HubSpot presents sales data in a dashboard with a deal forecast, an activity feed, upcoming tasks and a productivity timeline. Users can create custom stages and multiple pipelines with a visual, columnal layout where users can drag and drop deals into different pipeline stages (note the default pipeline stages correspond with HubSpot’s customer lifecycle stages). When Sales Pro is used with Marketing Pro, users can initiate an automated series of actions — known as Workflows in HubSpot — based on enrollment criteria such as lifecycle stage or lead score. The resulting actions include updating records, creating tasks, sending internal or outgoing emails and so forth. 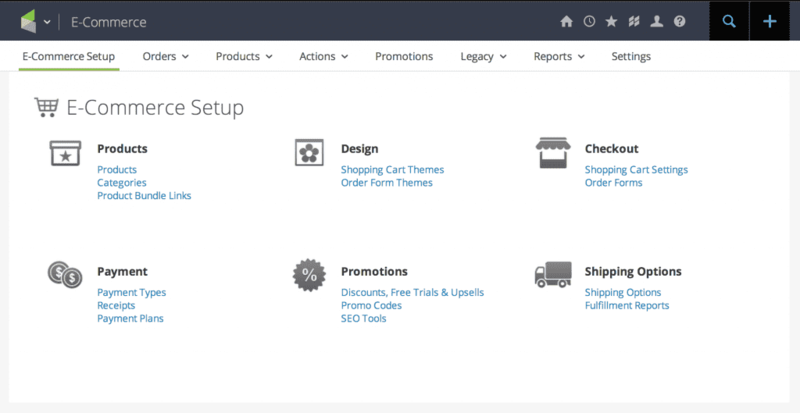 HubSpot offers ecommerce site-building tools as a purchasable add-on for $300/month. This includes page optimization, SEO recommendations, social media monitoring, visitor tracking, attribution reporting and ecommerce specific tools, such as segmentation based on shopping cart status and cross-selling or upselling functions. In terms of sales automation, ecommerce tools and ease of implementation — not to mention cost — Infusionsoft wins this round handily. Data is only as good — to humans — as it’s able to be visualized. Infusionsoft and HubSpot both offer marketing, sales and CRM admin reporting whose out-of-the-box features can be expanded through add-ons or extensions. Infusionsoft provides users with both high-level and targeted analytics for marketing and sales performance, order and billing, and user activity within the CRM. Users can view performances of entire campaigns and individual marketing assets, such as emails and webpages. Infusionsoft also allows filters for custom, targeted reporting. Infusionsoft marketing reports gather KPIs on marketing assets, such as conversion reports by sales stage, leads by source, segmentation data by activity, rate of opened emails, clicked links, and which contacts have performed certain actions. Email marketing data, landing page activity and number of downloaded content will be included. Infusionsoft also provides an overview of high-performing assets and campaigns. 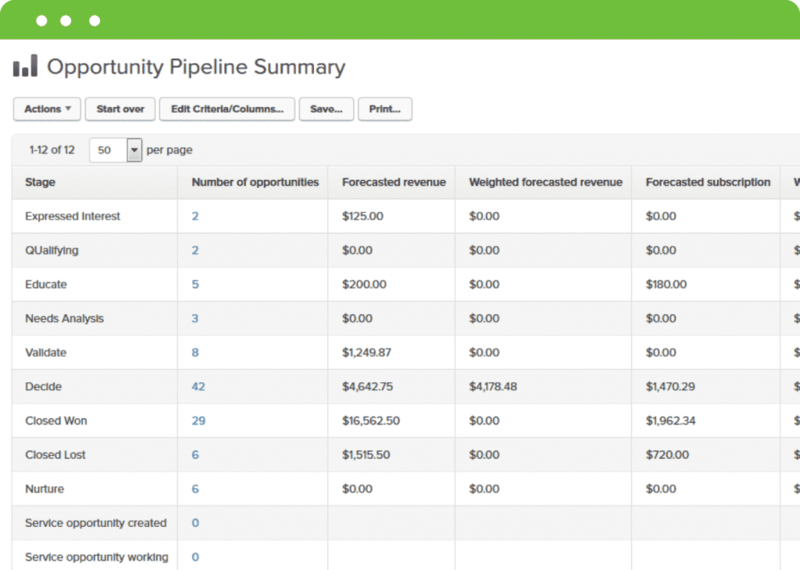 Infusionsoft also collects and reports on sales KPIs, including revenue by lead source, products, and segmentation data. It provides an overview of activity and generated sales by rep, the average time leads spent in each stage of the sales cycle, projected revenue, activity and revenue by referral, as well as custom opportunity reports according to user-defined criteria. 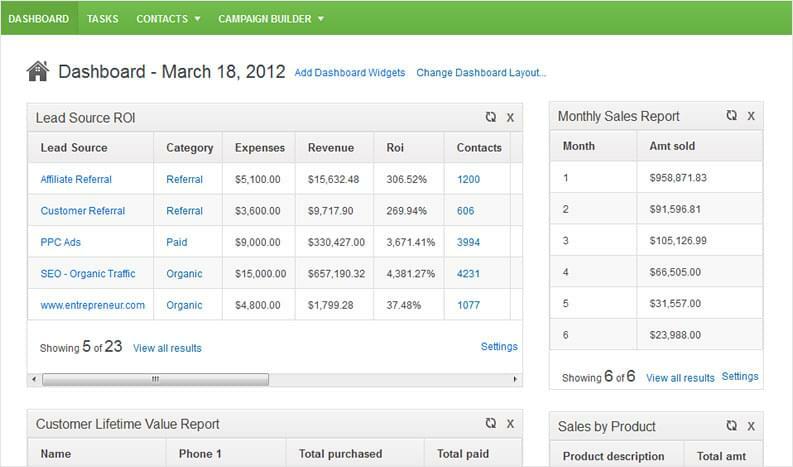 Regarding ecommerce, Infusionsoft offers over 20 built-in billing and accounts reports with a summary of sales, payments, subscription revenue, receivables and credits, in addition to customer lifetime value reports, income reports by lead source as well as reports on your custom order forms. Finally, CRM admins can produce activity reports on user logins, leads and contacts added, updates to the system as all tasks by user, type, due date, completion status and associated notes. There’s a considerable amount of built-in reporting functionality for all features of the Infusionsoft platform specific to various departmental needs from a bird’s-eye view down to the individual. Additionally, there are reporting and analytics extensions available for free download and paid subscription from the Infusionsoft marketplace. 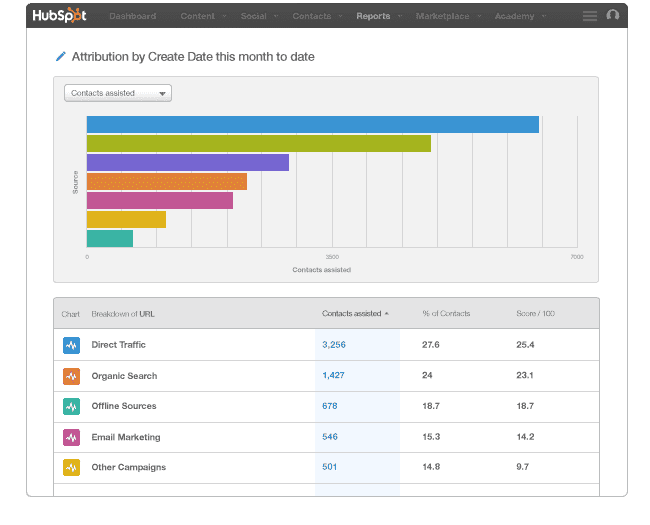 HubSpot Marketing Pro and the HubSpot CRM (which is included with Sales Pro) offer built-in analytics and reports on marketing campaign performance — from high-level to individual assets — and administrative activity. The former includes performance reports on assets such as landing pages, calls-to-action, emails, links, and individual blog posts, while the latter refers to actions taken by users, tasks, notes, updates and so forth. HubSpot meticulously tracks events related to website visitor and email recipient activity, such as links and buttons clicked, time spent on pages, conversion rates, bounce rates, content downloaded, purchases made, and using this data, HubSpot assembles highly-specific reports measuring the performance of campaigns and individual assets. (This is, after all, what enables the A/B testing of CTAs, templates and landing pages which becomes available in the Marketing Pro plan.) This allows for analysis of marketing performance and ROI in terms of pages viewed, traffic by source, customers by source, high-performing keywords and so on. HubSpot users can optimize their site design on a page-by-page basis to improve the quantity and quality of traffic. HubSpot also tracks the customer lifecycle from anonymous website visitor to prospect to lead to customer. Combined with event tracking on individual assets and elements with attribution reports, HubSpot Marketing Pro users can obtain a specific sense of which aspects of their site are pulling in the most traffic, which sources are yielding the highest quality leads, and so forth. (Note that we are reviewing HubSpot Marketing Pro, which is the middle tier of HubSpot’s paid Marketing plans. The upper tier — Enterprise, which costs $2,400/month compared to Pro’s $800/month — provides revenue reporting, custom event-based reporting, contacts reports and companies reports.) 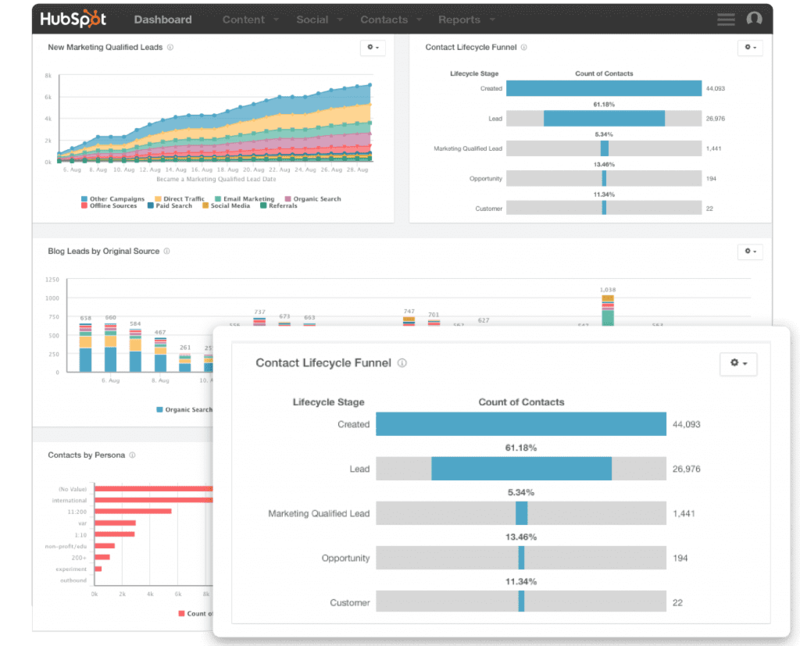 HubSpot offers a custom reporting add-on for $200/month. This allows users to apply custom filters to any metric or subset of data available in HubSpot Marketing, CRM or any integrated app using HubSpot Connect. It provides built-in templates for common reports and enables users to build custom ones using a variety of visualization tools with an unlimited number of dashboards for the marketing team. HubSpot offers considerable reporting capabilities, but the full range of reporting comes with their highest subscription tier and their add-on. The Marketing Pro plan offers capable built-in reporting on website visitor and email recipient activity, as well as CRM user data, but this is only part of the platform’s capability. Verdict: While it’s possible that HubSpot, as a deeply experienced inbound marketing platform, might be able to offer deeper insight into specific marketing asset performance — their calls-to-action comes to mind — Infusionsoft gives you the controls to your sales and marketing data from the outset. You’ll be able to produce revenue reports in the Complete plan. The Marketing Pro plan cannot, and if you want HubSpot to let you do it, you’ll need to increase your monthly cost by two hundred percent, and if you want custom reports and dashboards, you’ll need to add more on top of that. 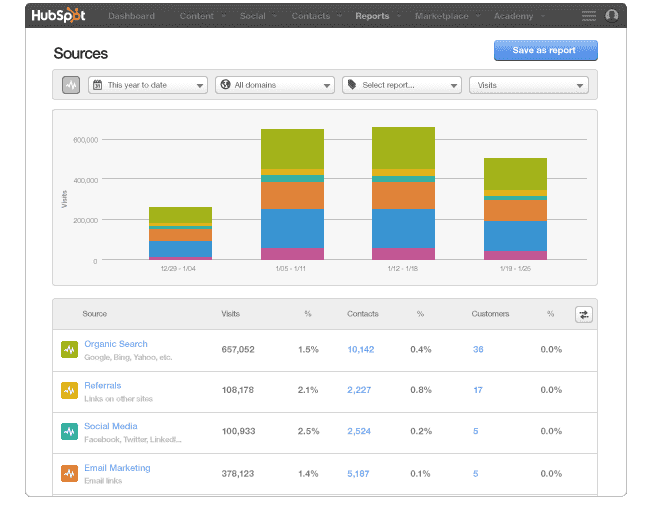 While I’ve no doubt that the full range of HubSpot reporting features are powerful, Infusionsoft more than covers your sales, marketing and CRM administration reporting needs at a far more affordable price point. The win for reporting functionality goes to Infusionsoft. In this case, it’s simply the better bang for your buck. 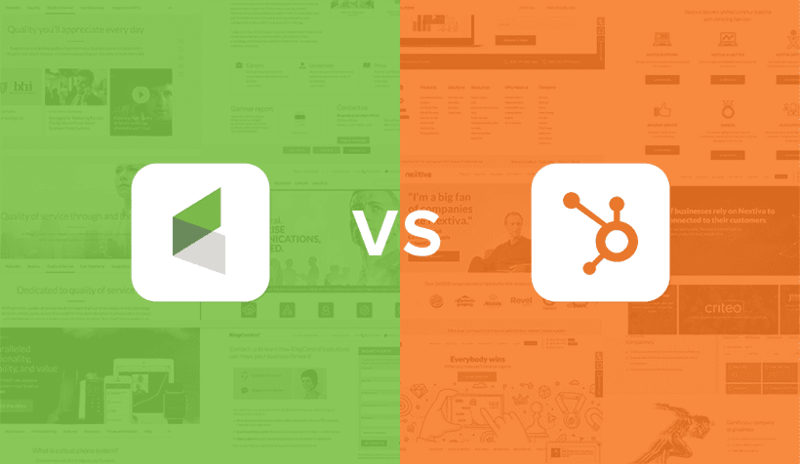 Both HubSpot and Infusionsoft offer paid and free extensions which can be found in their respective Marketplaces. Each Marketplace houses different types of extensions; while Infusionsoft’s includes a range of software integrations with third-party business applications, HubSpot’s Marketplace mostly houses creative assets for businesses to quickly deploy and customize their websites. 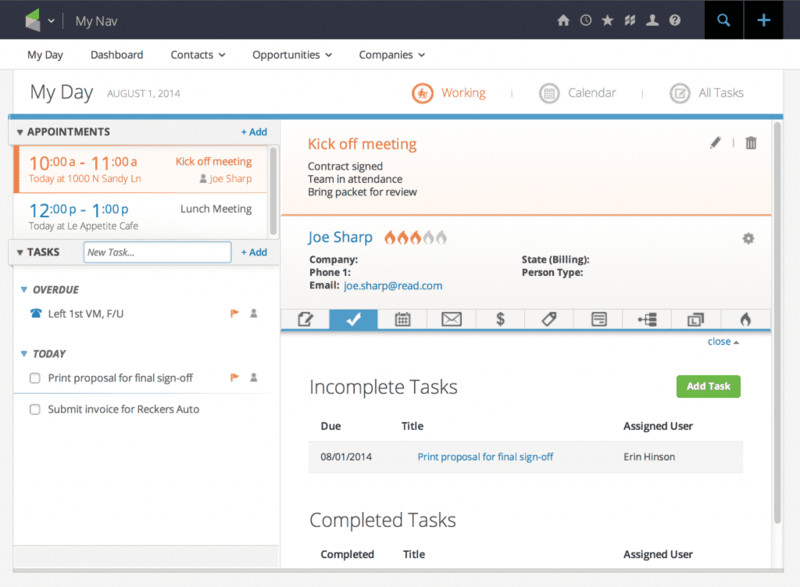 HubSpot also features software integrations, which are known as HubSpot Connect Partners. Infusionsoft currently offers a total of 551 integrations in their Marketplace (245 free and 306 paid) offered either as first-party add-ons or through third-party developers. These are listed in four general categories — Action Plans, Apps, Campaigns, and Services — and fall into fourteen separate types, ranging from ‘Integrations’, whose extensions can add features to your platform such as text messaging marketing automation or an updated user interface, to ‘Social’, whose extensions might include the functionality to create and update contacts through Twitter lead campaigns. Review this table for high-rated applications for each of Infusionsoft’s integration types. Infusionsoft’s Marketplace also includes filters for extensions by industry, for targeted lifecycle marketing, by region served, price, and certification. Overall, there is a fairly robust library of integrations, many of which serve business needs in multiple categories (omitted from the table for sake of showing diversity of applications). HubSpot’s Marketplace (or Storefront) includes a vast range of paid and free assets — by current estimate, there are 2,316 templates or template packs for page, email or blog design. These are filterable according to the asset’s purpose — for example, Contact Us, Ebook, FAQ or Pricing Table pages — and by industry, provider or feature. HubSpot’s Marketplace is a central location to obtain creative assets to customize and optimize your website. These fall into eight general categories — six template categories, one category for template packs, and one for custom modules. HubSpot’s Marketplace offers a considerable range of options that can help aspiring inbound marketers build and customize their websites quickly. As mentioned, HubSpot also offers software integrations with several key third-party business applications, referred to as HubSpot Connect Partners. These are also filterable by category. Certain categories have more than three integrations available, while two categories (Salesforce and Support) only offer what’s included on this table. Verdict: The Infusionsoft Marketplace and the range of HubSpot Connect Partners are better analogues for each other than the former with HubSpot Marketplace. This is because the HubSpot Marketplace, as mentioned, is essentially a digital storefront to browse and purchase creative website customizations or pre-built blog and email templates — highly useful, but which all work within the existing HubSpot platform without expanding its functionality. Meanwhile, the HubSpot Connect Partners currently number around 48 — including its integrations with HubSpot Sales Tools, which in the context of this article should be a given. So if we’re talking about sheer breadth of options for functional integrations, we’re comparing Infusionsoft’s 551 integrations to HubSpot’s 47. Granted, a good number of Infusionsoft’s are going to be redundant — you’ll choose an extension at the exclusion of others that perform the same role — and certain integrations with popular business applications, like Xero or Freshbooks, are developed by third-parties, albeit Infusionsoft-certified ones. There are also plenty of native integrations for each platform. This isn’t to neglect the role of the HubSpot Marketplace — it offers a wealth of creative design elements to customize your site according to industry and other criteria — so it really comes down to your use case. In my opinion, Infusionsoft’s Marketplace fulfills the needs of a larger range of use cases than HubSpot’s list of Connect Partners, so the win goes to Infusionsoft. Both Infusionsoft and HubSpot offer online knowledge base libraries with FAQs, how-to articles and videos in addition to community forums. Each vendor also provides technical support beyond their onboarding packages which will be compared below. Verdict: Infusionsoft and HubSpot both offer extensive knowledge bases and community forums. HubSpot has an additional designer community — which makes sense, because part of the essence of inbound marketing is attractive design — and HubSpot also goes above and beyond with support options for paying customers, including international, toll-free phone support, online ticketing, social support as well as the option to pay for a dedicated technical support agent for your specific business. While Infusionsoft is accessible, HubSpot clearly has made accessibility a top priority. HubSpot handily wins the round for customer and technical support. For the sake of this Infusionsoft vs. HubSpot comparison, I chose two relatively equal plans — well, in HubSpot’s case, I combined two — but each provider has several subscription tiers to choose from. 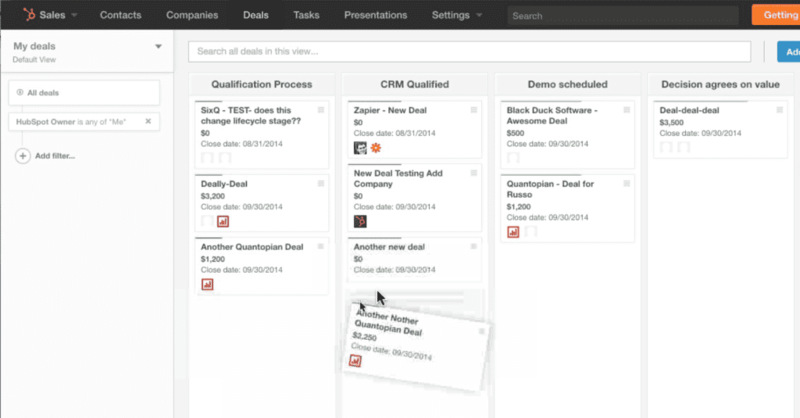 Note that Infusionsoft and HubSpot Marketing both require paid onboarding sessions. See below for details. Infusionsoft offers five subscription plans and three Kickstarter (onboarding) plans. Infusionsoft customers can choose any Kickstart package they prefer, regardless of their subscription plan. Note that all Infusionsoft subscriptions are annual contracts that are billed monthly. 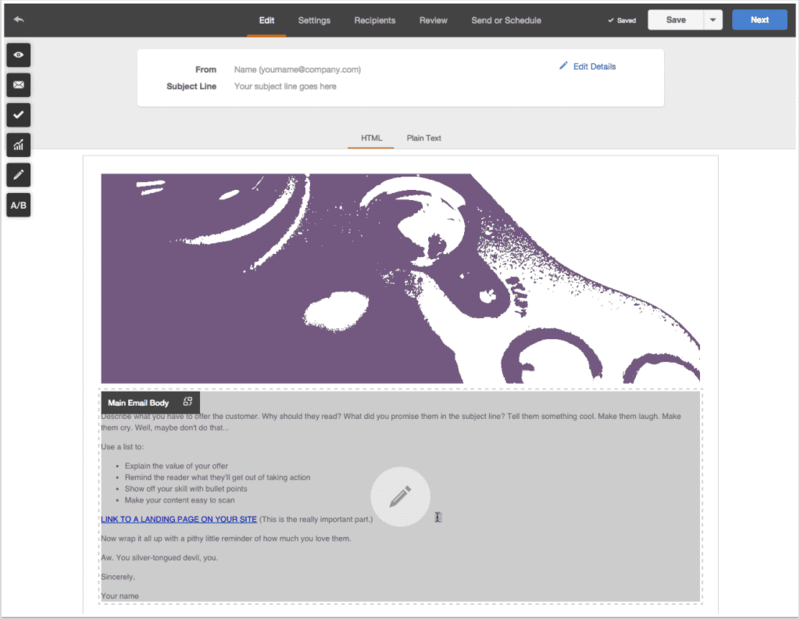 HubSpot offers three paid Marketing Plans and one paid Sales plan. The Marketing plans have required onboarding that is specific to the plan. In other words, customers cannot pick and choose which onboarding package they prefer. *The technical limit for contacts in HubSpot Sales Pro is 1,000,000; however, when combined with a HubSpot Marketing plan, the Marketing plan’s contact tier pricing will apply to any additional contacts above your allotted threshold. Note that all HubSpot Marketing subscriptions are annual contracts that are billed monthly. Verdict: One must account for provided features when evaluating whether a price point is worth what you’re getting in return. As mentioned in the beginning, I feel these two plans respectively provide each vendor’s best value for their target customers. Infusionsoft’s target customer has been explicitly stated as SMBs with 2 to 25 employees. HubSpot’s target customer is harder to pin down, but presumably it caters more to SMBs, as its Enterprise plan is priced in the range of very competitive, highly-regarded enterprise-grade marketing solutions. Between these two plans, I think Infusionsoft is priced not only more fairly, but also more clearly. HubSpot users will see their monthly pricing automatically increase should their number of contacts exceed their Marketing subscription tier limit. That said, HubSpot’s Connect Partners offer integrations with popular business apps, while many analogous integrations in the Infusionsoft Marketplace must be purchased at monthly subscription. In HubSpot’s favor, their Marketing plans allow for unlimited marketers, so while the monthly cost is higher, if you have a large team of individuals employed in a marketing capacity, they can each use the platform without worrying about number of available user roles. Nevertheless, I think Infusionsoft’s pricing is better suited for their target customer. Infusionsoft and HubSpot are both very popular, highly regarded solutions with tens of thousands of paying customers. Their customer bases don’t fully overlap, but even where they do, there are clearly plenty of businesses that find their solution sufficiently meets, or surpasses, their expectations for a combined marketing, sales and CRM platform. That said there are plenty of areas where one solution might exceed the other. When it comes to inbound marketing, HubSpot is the household name for customization, analytics and optimization — after all, they invented it — though other platforms have had time to catch up, and Infusionsoft’s tools are no slouch. And when it comes to sales automation, Infusionsoft seems to allow a greater range of configurability for lead nurturing, prospect outreach, and CRM activity automation than HubSpot. 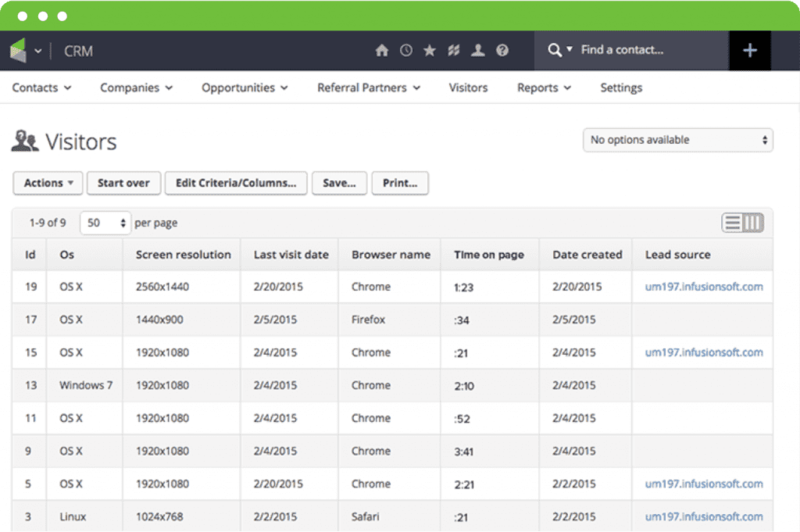 Also, as unified sales and marketing platforms, Infusionsoft’s visual campaign builder resembles what you would find in enterprise-grade marketing software, and HubSpot doesn’t have it. Infusionsoft Complete offers more ecommerce tools out of the box, more in-depth and custom reporting out of the box, and a far greater range of functional integrations than the combined plans of HubSpot Marketing Pro and Sales Pro. Infusionsoft also delivers them at a more affordable monthly rate than HubSpot. In fact, Infusionsoft’s more expensive plan — the Team plan, which costs $599/mo for 10 users — is still less expensive than HubSpot’s Marketing Pro plan alone. Not to mention that any Infusionsoft customer can choose their own onboarding package according to their use case, while HubSpot Marketing customers are restricted to purchasing the onboarding package associated with their plan. When it comes to customer and technical support, HubSpot has the edge on Infusionsoft. They offer more support options and greater accessibility. Infusionsoft could step up their game in that regard. And when it comes to scalability, I think HubSpot has the edge here as well. HubSpot is the kind of platform that grows with you — if your company has a highly active online presence, including lead generation, and intends to hire and grow aggressively, this platform can better accommodate you. Infusionsoft makes no bones about its target customer — from 2 to 25 employees, and upwards of about 100 — and their platform is tailored specifically for that market. So, as usual, it comes down to business needs, size, budget and goals. For very small to small businesses, even going as far as midsize, Infusionsoft is a superior marketing, sales and CRM platform. Infusionsoft offers more overall features and better integrations at a lower price point for businesses in a wide range of industries, particularly those that require an online storefront. On the other hand, if you don’t have immediate need of an online storefront, and you’re more concerned with marketing your business with attractive blog content and highly customizable, personalized landing pages, emails and calls to action, HubSpot is the inbound marketing specialist you shouldn’t rule out. For other head to head comparisons, check out our feature on Insightly vs. Base and Zendesk vs. Freshdesk. For overviews and user reviews, feel free to take a look at our CRM comparison guide.